Exclusively for B&H customers, this AKG C3000 Studio Microphone Twin Pack are a set of 2 cost effective studio condenser microphones well suited for project studio recording and live sound applications alike. The kit includes a pair of shock mounts. 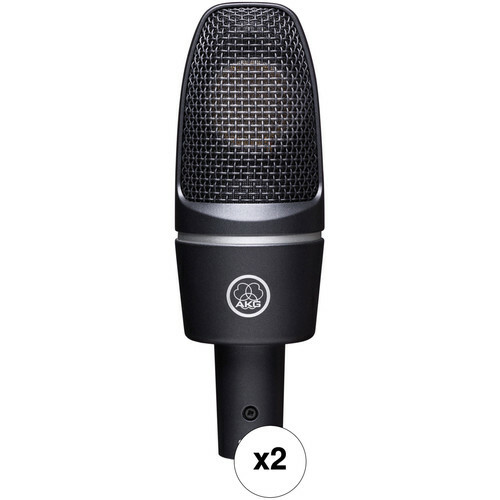 The AKG C3000 Studio Microphone is a cost effective studio condenser microphone well suited for project studio recording and live sound applications alike. The C3000 is an ideal choice for both vocals and instruments with its wide frequency response, cardioid polar pattern and high SPL capability. The -10dB pad switch maximizes headroom when capturing transient (peaking) signals, and a 500Hz low frequency roll off switch minimizes low-frequency noise, proximity effect noise and more. The microphone ships with a shockmount. Box Dimensions (LxWxH) 11.2 x 8.35 x 3.5"